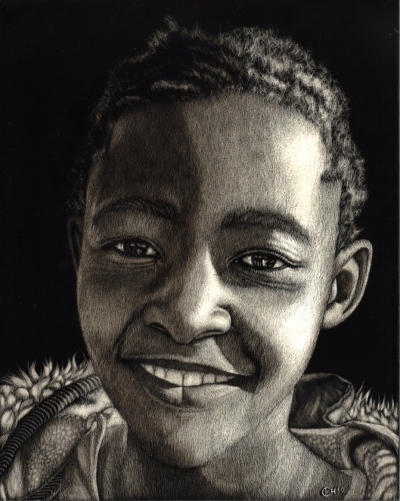 Following along with my series of portraits from the school in Spitzkoppe in Namibia, I have my latest scratchboard of a gorgeous girl which I’ve titled “Hope for Africa”. Ok, to work. 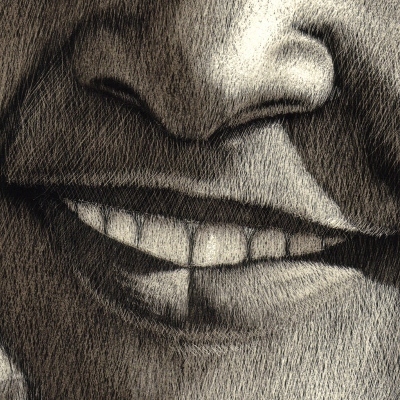 I’ve included a gif (an animation with a series of images rotating through) to show the different stages of the portrait, and I’ve also included some closeups to show the ‘feathering’ technique I’ve used. This technique involves scratching parallel lines, and then another set over them at a slightly different angle, and then more and more, each set at only a slightly different angle. This differs from ‘cross-hatching’ where your lines are often at 90° to each other. 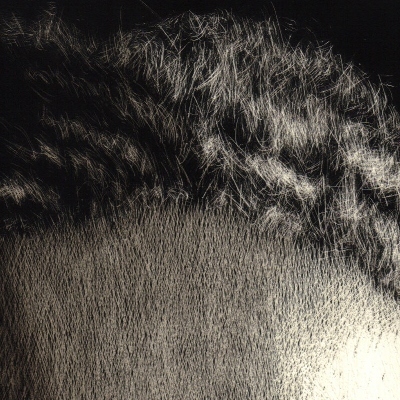 An example of feathering is shown below. 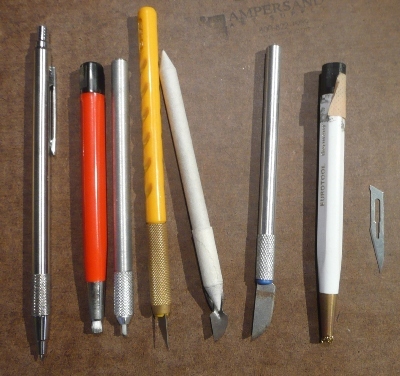 So if this is the first time you’ve seen scratchboard, below is a selection of the tools I use. I have described most of them elsewhere but I’ve only used two of them in this portrait. I’ve put the scalpel blade (extreme right) into the yellow handle for all of the ‘feathering’ as this blade can produce very fine lines and I’ve done the hair very quickly with the brass bristled brush (second from right). I hope this has been of some use to someone out there. Thank you for taking the time to publish you process. It is so interesting to see and beautifully done! The detail you get is amazing! I love your artwork. 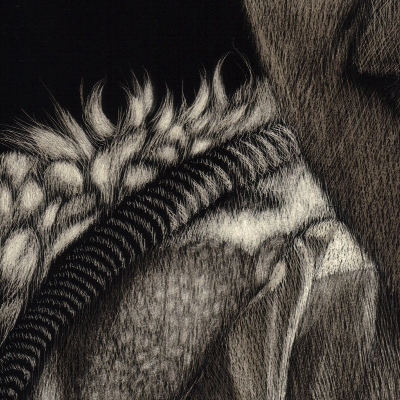 I’m an art teacher and we are just starting Scratchboard and I have been looking for some art work to show the students that really represents what can be done with this beautiful art medium. Again, Thank you for showing the world what you can do. 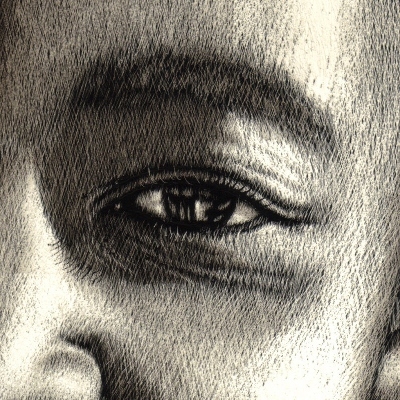 Breathtaking fine art in scratchboard. Thank you for showing me how you do it. Would love to take a class from you.